Got a new arrival on its way? Baby boys and girls bring endless joy to your family, but they can be expensive too. Luckily, with a Kiddies Kingdom voucher you can enjoy fantastic savings on a wide range of baby and toddler products. From prams and pushchairs to car seats, nursery furniture, toys and more, Kiddies Kingdom voucher codes will help you get prepared without spending a fortune. Kiddies Kingdom started way back in the 1980s when current director Hanif Patel launched Nappy Factory, a wholesale supplier of nappies offering a quality product at bargain prices. Establishing themselves as one of the top nappy suppliers in the North West, the company grew over the years to launch their own factory shop and branch out into other baby products from some of the top brands. In 1996, the company opened their flagship store in Dewsbury, England stocking a wide range of baby and toddler products and accessories – the same fantastic range that's stocked in the Kiddies Kingdom online shop. Today, Kiddies Kingdom enjoy a reputation as one of the biggest and best independent baby retailers in the whole of the UK, with thousands of products kept in stock in their warehouse and ready to ship out to you the moment you order. Because of their long experience in the industry they are able to negotiate the best deals with all the most famous names in baby and toddler care, passing the savings on to their customers in the form of lower prices – so you can get more for your money! At Kiddies Kingdom you'll find an incredible range of products designed to cater for children's every need from ages newborn right up to toddler. What's more, everything is available to browse by category or by brand – so it's easy to find exactly what you're looking for. Planning for a new baby and need all the essentials from prams and car seats to highchairs and cots? Kiddies Kingdom stock a wide selection of items in a range of prices to suit every budget and household. Or perhaps you're looking for the latest baby toys to keep your little one entertained and inspired? Choose from bouncers and rockers, activity centres, ride on toys and much more. Want to get shopping with Kiddies Kingdom? With a Kiddies Kingdom voucher you can enjoy fantastic savings on their wide range of baby and toddler products and accessories. Whether you're starting from scratch or just picking up a few essentials, Kiddies Kingdom voucher codes will save you money while you shop. Wide range of products and accessories for babies and toddlers of all ages. Browse our website until you find a Kiddies Kingdom voucher that suits you, then navigate to their website to begin shopping. Enter your Kiddies Kingdom discount codes in the box provided and click 'Update prices'. Want to find out more about fantastic baby products with Kiddies Kingdom? Why not pay a visit to the company's dedicated YouTube channel here? You'll find lots of exclusive content including product previews, assembly guides, video tutorials and more. You can also use this channel to find out more about saving money with Kiddies Kingdom voucher codes. 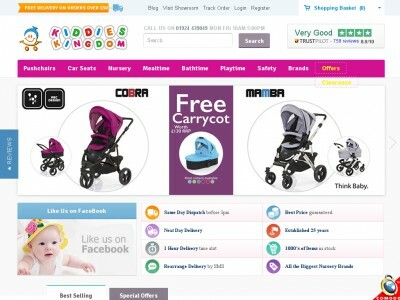 If you've enjoyed shopping with Kiddies Kingdom, you might also like to check out more great deals on baby and children's products at stores like Babies R Us and Mothercare. Of, if those aren't up your street, you'll find plenty more deals to browse in our Baby, Kids and Toys section. Enter your Kiddies Kingdom voucher in the box provided and click 'Update prices'. Choose your delivery options and click 'Continue checkout'. Standard UK delivery is free on all orders over £50. For orders below £50, a delivery charge of £5.95 applies. If you need to return a product for any reason to Kiddies Kingdom, you can do so by simply returning your items in their original condition within 14 days of receipt. Need to speak to the team at Kiddies Kingdom? Whether you have a question about your order, want some expert advice on choosing the right product for your child or just want to find out more about how you could make fantastic savings with Kiddies Kingdom vouchers, you can contact the Customer Services department by telephoning 01924 439049. Want to discover more from Kiddies Kingdom? Why not follow them across your favourite social media networks for access to lots of interesting content including competitions, special offers, baby news, nursery design ideas and more. You can also use these pages to find out more about saving money with a Kiddies Kingdom discount code. Don’t forget to check them regularly, as you can never be sure when a free Kiddies Kingdom might be waiting for you! Buy now online at www.kiddies-kingdom.com. When my first daughter was on her way, we were really worried about how much it was going to cost to get everything she would need. Then I discovered a Kiddies Kingdom voucher online. With Kiddies Kingdom vouchers you can enjoy amazing deals on a wide range of babies and toddlers products at kiddies-kingdom.com. I used my Kiddies Kingdom voucher codes to get a fantastic price on a brand new pram and some nursery furniture – and saved enough for some toys too! So get your discounts now!